Kanekomiso Co., Ltd. run a business aiming at providing “Relief” “Satisfaction” and “Happiness” for customers. We always make the best efforts so that our business partners are satisfied with the partnership with our company, employees are satisfied with working for our company, as well as our company itself is always needed by the whole society. Aizumi-cho, where our company is located, is surrounded by the great nature of the Asan Mountains and the Yoshino River. Since Edo era, people have grown soybean as a secondory crop around this area. The soybean has been famous for its high quality and the big yield. The local people around this area such as Naruto also often have grown salt. Therefore, more and more people have started to make Miso. Our company was founded 84 years ago, in 1932. 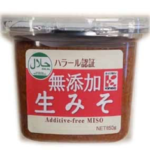 We produce various kinds of high-quality products including Miso by getting the most of nature materials. Feature: We offer specialty Gozen-miso from Tokushima in which we do not use any alcohol, and produce it without heating. Feature: Our Rice Malt Drink contains an abundant amount of glucose, vitamin, and amino acids, all of which are quite nutritious and helpful for us to stay healthy. It is so nutritious that it is like “drinking intravenous drip”.